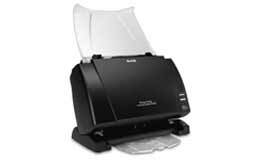 Compact, fast and powerful, the KODAK PS410 Photo Scanning System makes it easy to Digitize your treasured photos, postcards and even old documents so they can be shared by e-mail, displayed, printed, output to digital media and more. Just take the photos exactly the way you receive them--mixed sizes, different paper weights, random orientation--and place them in the fast auto-feeder. 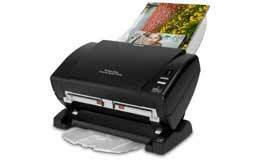 The PS410 easily handles photos from (2 x 2.5) up to (8.5 x 34). Digitize hundreds of photos in minutes. Rapidly. Easily. Sharable. Archivable. 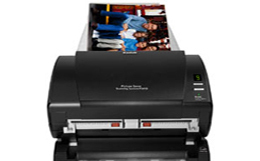 Additionally, an optional A3 & A4-size flatbed scanners can handle oversized, mounted, bound or fragile photos. With the Kodak Gentle Photo Separation Module, the specially designed transport treats every photo with extra-gentle care; an optional document separation module is also available. Start, stop, or reopen an existing scanning job at any point in the capture-edit-output cycle; this gives you the flexibility, for example, to stop a current job, start an urgent new customer order, and then easily reopen and finish the previous job without losing productivity. Provides an automatic slideshow of a customer's images on a Kodak Picture CD, plus optional uploads to the Kodak Gallery (with a link to one-step downloading of Kodak EasyShare Software). Physical dimensions 9.7 x 6.3 x 13 "
ADF Feeder Paper Size Min. - W x L 2 x 2.5 "